Twenty years ago, after encountering W.S. Merwin's translations of Pablo Neruda, I sought out the poet's own work. The literal meaning of Merwin's oblique, unpunctuated phrases can be elusive, but that often strengthens their figurative power. Merwin's writing reminds me of Claude Debussy's injunction about music: â&#x20AC;&#x153;Never Vague. Always Ambiguous.â&#x20AC;? Witness sets to music three poems about the fraught relationship between human beings and the natural world. Merwin's environmental advocacy extends beyond the written word: over the course of four decades, he has cultivated a vast, biodiverse collection of palm trees at his home in Maui. In 2010, W.S. and Paula Merwin co-founded the Merwin Conservancy, to preserve this wellspring of art and life. 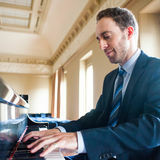 Witness was commissioned by the Peabody Children's Chorus, and premiered on their summer 2017 tour to Seattle, Washington, and Honolulu, Hawaii. 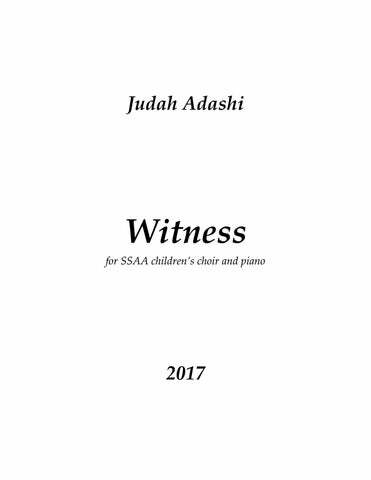 © 2017 by Judah Adashi | BMI "Ash," "Witness," and "Place" from Migration: New & Selected Poems by W.S. Merwin. Copyright © 2005 by W.S. Merwin, used by permission of The Wylie Agency LLC. & œ . œj ˙ . j j œ œ œ ˙. p sempre œ Œ. J ˙. & œ œ œ ˙. &œ œ œ œ œ œ œ ? œ œ œ œ œ ˙. &œ œ œ œ œ ?